With migrant arrivals to Spain’s southern shores on the rise, a lot of them are heading north to the border town of Irun, some sleeping rough as they wait to cross into neighbouring France, locals and officials said. Residents and associations in the northern Basque city joined forces last month in an informal network to bring food and clothes for the migrants after they were alarmed at the increase, said Bibi Liras, an activist. She said that as a border town, Irun has always seen a drip-drip of migrants waiting to cross into France. 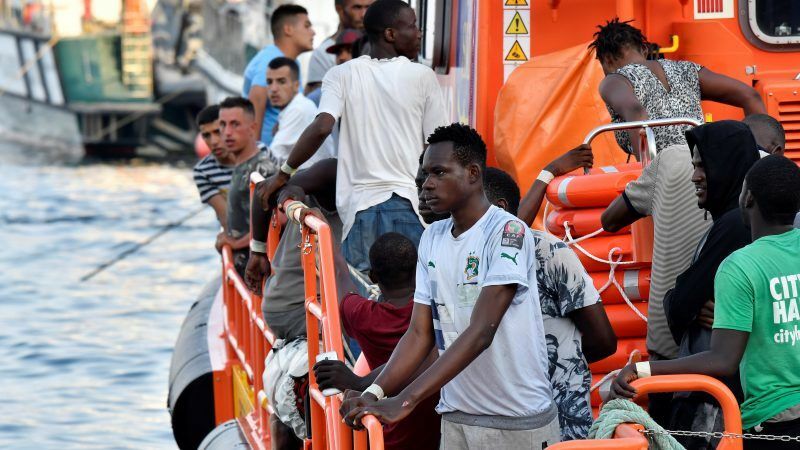 But there has been a marked increase since last month, she said Thursday (9 August), the same day as 87 migrants rescued off Libya arrived in the southern port of San Roque on board an NGO charity ship. “It started to be unusual when we saw they were starting to sleep in the train station or in places where cars were parked,” she told AFP. Liras said Irun now sees an average of around 40 migrants a day, from just four to five previously. The Red Cross manages a shelter in Irun that takes in 24 people, as well as three other establishments in the rest of the Basque Country. Altogether, they have room for 177 people, a spokesman said, and they are allowed to stay three nights, sometimes four. He added that the Red Cross attended to nearly 1,600 people in the region over the past two months. Those in Irun who don’t find a place in a shelter, or don’t want to stay there, are taken care of by the network of volunteers who cook them meals and give them clothes, said Liras. A dance institute also lends its showers to those who need it. But they have nowhere to stay, and many sleep rough at the railway station. But he cautions the numbers are still manageable. “We’re not talking about hundreds,” the source stressed. Many of the migrants come from sub-Saharan Africa and are heading to France or Belgium, where they have family or friends, he said. But crossing into France is tough. French authorities have an agreement with Spain that enables them to quickly return any migrants they catch on the border, or who have been in France less than four hours, the Basque government said this week in a statement. This has been criticised by associations that argue they should be allowed to move freely within the European Union. Those who have been in France longer than four hours are entitled, by law, to a lawyer and the process to return them to Spain will take longer, said the government source. we should arrange to get as many women to come to Europe as there are coming men. It is a recipe for trouble.